In this nest of pages, you will find documentation and analysis of the Waihopai Ploughshares action of April 30 2008 – and its consequences. The three activists, Sam Land, Adi Leason, and Fr Peter Murnane, broke into the Waihopai spy base – part of the Echelon ELINT system, part of the UK/USA intelligence agreement – an instrument of war. 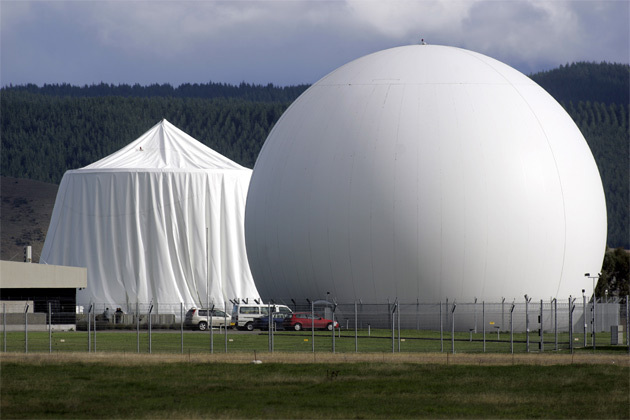 It’s in the north of the South Island, and run by the GCSB (Government Communications Security Bureau). They evaded all the security, and brought down a dome with sickles. They temporarily interrupted base operations. Sam, Adi and Peter stood trial for their action in the District Court of Wellington, beginning 8 March 2010. on 17 March 2010 a jury of 11 took two hours to acquit unanimously on 9 charges. It’s useful to think of a jury as the conscience of the community. In which case this jury was impressed by the honesty and integrity of the accused on one hand, and on the other they are troubled by the present wars, and by the role NZ may be playing through its cooperation with the US in intelligence gathering. As an activist I’m interested in how to make continuing and stronger appeals to our society’s conscience, and I reckon there are lessons to be learned from the Waihopai Ploughshares.